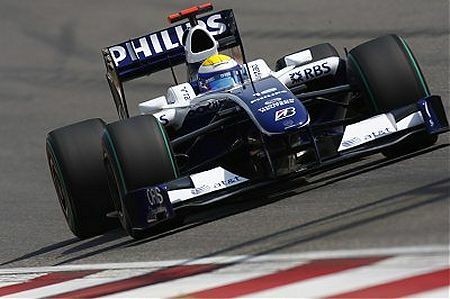 The first practice period for the Bahrain GP was largely devoted to the teams working on long runs. BMW used the opportunity to go out on soft tires and set the second and third best times, probably as high as they will get all weekend. Hamilton put in a time good for fastest of the session but, behind these three, massed the new challengers of 2009 - Williams, Brawn and Red Bull. The Toyotas were well down the order, however, and the conclusion had to be that it was too early to see any true indicators of form emerging. Come the second session and the expected order began to appear. There was Rosberg quickest of all, echoing his practice form of the first two races this year. The Brawns were not next, being beaten this time by Trulli's Toyota, Alonso's usual death or glory run and the two Red Bulls. The heroes of yesteryear were struggling, McLaren achieving something like respectability with a quick run from Hamilton but Kovalainen, Ferrari and BMW trailing the field. Force India's improvements to the car have obviously worked and they are no longer the residents of slots 19 and 20, Sutil looking good in getting to 7th fastest and Fisichella not far behind in 12th. And that was the dominating feature of this session, the tiny differences that separated the cars; only 1.5 secs covered the whole field, half a second the quickest ten. Qualifying is going to be a tense affair, with the smallest of mistakes sufficient to lose a driver several places on the grid. No doubt Brawn GP will produce a little extra speed in the battle for grid spots, Toyota and Red Bull are looking very good and Alonso will magic an unbelievable time on light fuel, but the drivers need to get everything right if they are to feature in Q3. Ferrari and BMW must surely improve at least a little but may be out of contention for the top ten; Force India are likely to leave a couple of teams unexpectedly behind in Q1. It leaves the race very hard to predict. With the times this close, the factor of luck looms large and the race to the first corner will become both frantic and furious. We can also expect some desperate passing moves together with the collisions they entail - plenty of potential for tears therefore. That increases the chances of intervention by the stewards too, with penalties upsetting the order and taking out the unwary. Taking a wild guess at the grid order, I think it is time that Rosberg converted his practice form and grabbed pole. Alonso may not go as extreme on the short fuelling this time so I would hazard a spot at about fifth for him. I can see Trulli making it to third with one of the Red Bulls immediately behind - probably Vettel. And Button must surely be good for second. Webber will be in the top ten, as will Barrichello and Glock, and Massa might spring a surprise on this, one of his favorite tracks, to sneak into Q3. Hamilton must also be a possible in spite of his car disadvantage. Things are so close that I am bound to be proved wrong tomorrow. There are probably fifteen or so drivers with good chances of making it into Q3 but, equally, Force India's sudden acceleration means that there will be some big names left behind in Q1. It all points to a fascinating battle for grid places and a bitter struggle in the race. Hopefully, that is what we will get. What makes Force India's performance all the better is that part of their upgrade is stuck at customs until tomorrow. Still, I am a very happy supporter right now. Heard the nose of force india acts to give the car more downforce that it is not supposed to help with. Any news, any diffuser like problems in future?? I can only imagine..
Yeah, it really looks to be a real slam-bang affair on Sunday. Qualy should be pretty cool as well. Arun: I have not heard anything about the Force India upgrades for the weekend apart from general stuff like a new floor, wings, etc. Whether that includes an amended diffuser design, I don't know - the team has been pretty quiet on what exactly they're up to. Which is why their obvious improvement in practice is such a surprise. It's a good sign however - much better to play your cards close to your chest than trumpet the arrival of new bits only to disappoint. I would be cautious about Force India improvements, they have show signs of better pace on fridays and then get stuck at the end come qualifying. I do expect Sutil to finally make into Q2, but I'd still count Fisi as very likely to be dropped in Q1. Normally I would agree with you, Filipe, but there is more to today's showing than just one hot lap. Both Force India drivers were consistently fast and kept improving. That is what is different this time and it makes me a bit more optimistic about their chances than usual. Arun, you are correct in saying that the nose is supposed to generate more downforce as well as channel the air in a way suiting the new aero package. I'm not aware of any controversies concerning any part of the upgrade pack, other than the obvious one that several bits got stuck at customs. Somehow I can't see any other team protesting that - especially given the precedent that a Williams nose was blown up by French customs in 2002 with merely a reference to it being "the ultimate crash test". (The nose did not withstand the "crash test", in case anyone is wondering). Apart from the nose, there was an interim double diffuser design, along with reprofiled sidepods, new front wings and "a few other bits" (according to Adrian Sutil).